Russia’s defence minister Sergei Shoigu says Moscow will proceed with its plans to create a new submarine fleet in Vietnam. “This year our joint efforts will open a new page in Vietnam’s navy – a new fleet will appear,” Shoigu said during a vist to the country. “We have discussed the issues of training Vietnamese military in Russian universities, and touched upon military-technical cooperation” said General Phung Quang Thanh, Vietnam’s defence minister quoting Shoigu. “Vietnam continues its active cooperation with Russia in this sphere and buys Russian armament and military equipment,” added Thang. 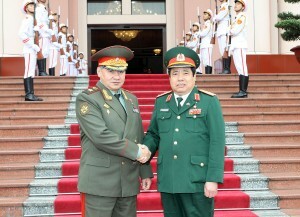 Talks between Russian and Vietnamese defense ministers were held in Hanoi, the capital of Vietnam. It has set its sights on becoming a developed nation by 2020. Nguyen Tan Dung, Vietnam’s prime minister approved a plan to restructure the economy earlier in February after a disappointing year for the economy in 2012. Commenting on the outcomes of the talks between Shoigu and his Vietnamese counterpart, Vietnam’s President Sang said they would boost bilateral cooperation between the two countries. Last year the two countries signed a contract on the delivery of six Kilo class diesel submarines to Vietnam worth $3.2 billion – one of the largest deals in the history of Russian exports of naval equipment. According to the Vietnamese trade Counsellor in Russia, Pham Quang Niem, Russia’s exports to Vietnam increased by nearly 4 per cent to $1.388 billion last year, while imports rose to $2.272 billion worth of goods, up 32 per cent. In 2010, during the then-President Dmitry Medvedev’s visit to Vietnam, the two sides signed a deal on the joint construction of the country’s first nuclear power plant. President Vladimir Putin reaffirmed Russia’s commitment last year, promising to provide $10 billion in credit to Vietnam.